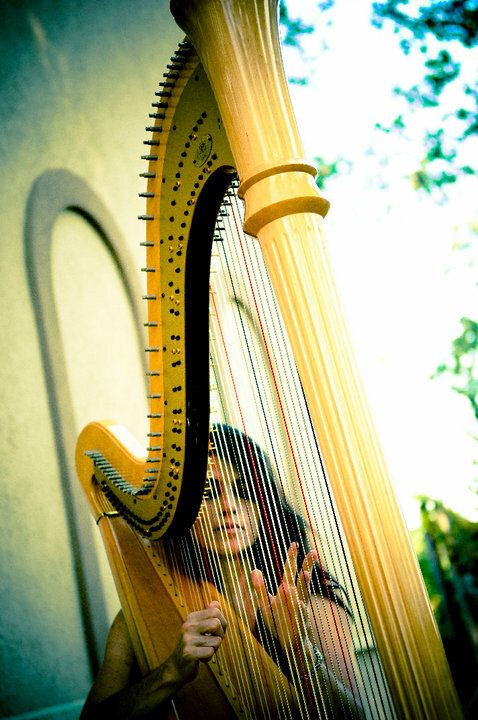 Trista is a professional performing harpist, recording artist, and fine artist. She offers non-traditional music lessons online + in person (current teaching studio = Columbus, Ohio) and embraces an unconventional approach to both performance and education, often collaborating with other creatives. Her repertoire includes classical, Brazilian, jazz, popular selections, and her own compositions. In addition to performing solo, she has played with the jazz improvisational Nova Madrugada, alternative folk rock Luceys Maze, art pop rock Flotation Walls, and others. In the Fall of 2011, Trista toured with Deborah Henson-Conant, offering performances and a creativity workshop they developed together called Fireworks for the Creative Spirit. Trista is also the U.S. representative of the internationally-known Jazz Harp Foundation. Trista and her younger sister were born in the luscious beauty of Oregon, a great contrast to the arid Colorado environment where she found herself six years later with a new baby brother. Eventually her family made its way across the United States to settle amidst the great sprawl that is now central Ohio. Trista studied both music and art at Capital University (Bexley, Ohio) and then transferred to Ohio University (Athens, Ohio) to study Music Therapy. Trista completed her six-month music therapy internship at St. Luke's Medical Center in Cleveland, Ohio and is a Board-Certified Music Therapist. While attending an almost-mandatory art gallery opening at Capital, Trista encountered a harpist; in that moment she felt she must play this instrument. After convincing the university to extract it's only harp from a professor's office where it was being used as a coat rack, Trista began harp lessons in addition to her formal piano studies. Trista records and plays on a Lyon & Healy 85E. Learn more about Trista by visiting her blog, signing up for monthly News, listening to music samples, or connecting face-to-face at her next performance where she’ll probably give you a hug.